With her pulse on the trends of both fashion and celebrity, Lucie Doughty serves as Editorial Director for Paul Mitchell. She is a leader in styling hair for photo shoots and events, and she mentors up-and-coming stylists in the art of editorial shoots. In her spare time, Lucie maintains the manes of celebrities such as Rene Russo, Elizabeth Banks, Miranda Kerr, Daryl Hannah, Liz Phair, Audrina Patridge, Julie Benz, Brooke Hogan, Shane Lamas, Tinsley Mortimer and many others. Teetering on the edge of ultramodern and eclipsing yesterday’s mod moment to encapsulate this season’s must-have hair color and style trends, Paul Mitchell® Global Editorial Director Lucie Doughty explores treasures of our past to give shape to the new cool-girl street style celebrated today. Colors are rich and bold in a range of high-pigmented indigo, bright green and neon-red shades. Painted onto the hair for precise application, hair is vibrant and reflective for a super shiny and glossy finish. Offers a spectrum of electric shades for a bright pop of color. Available in 13 intermixable shades: Purple, Red, Pink, Blue, Bordeaux, Teal, Yellow, Orange, Green, Opalescent, Steel, Midnight and Diluter. POP XG features a conditioning base for soft, shiny and even results. The rich, cream texture is perfect for controlled, clean application. A throwback to the ’70s and a nod to 2017, the intense indigo blue, denim-like shade with brushstrokes of grey tones, dance along the iconic Farrah Fawcett cut—feathered and fearlessly flawless. These baby blues come with a side-swept, sultry ’70s appeal. 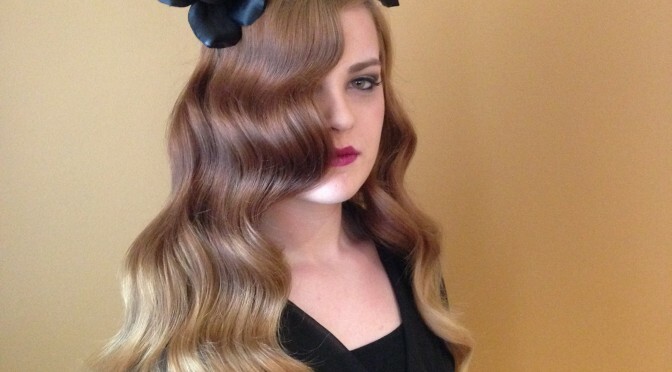 The signature look translated to this voluminous ‘do of-the-era. Doughty added pops of silver, blue-grey, peach and lime green tones. With a bold bob and baby fringe, this violet tie-dye inspired color is an electric, playful must-have hue. 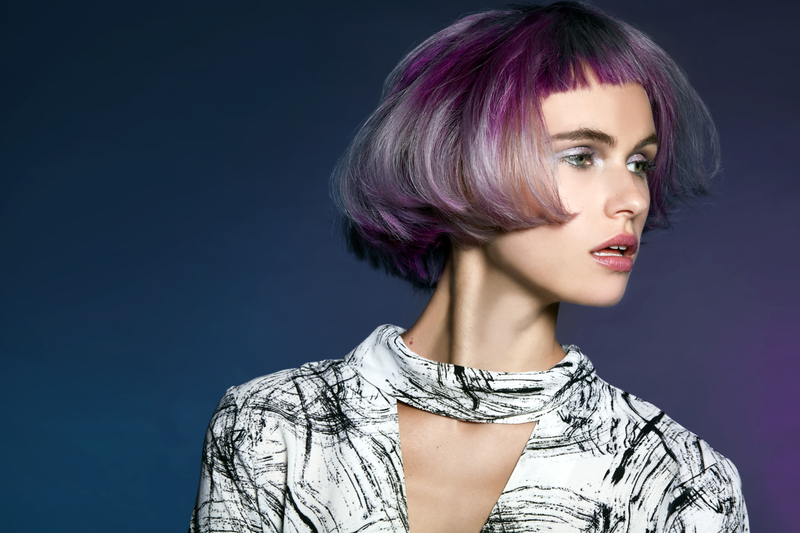 The bold amethyst color along with the tie-dye technique adds shape to the short haircut and brings a sense of playfulness and a much softer touch to the bold lines of the cut. Baby bangs have a connotation of rebelliousness and play into the rock ‘n’ rolls vibes of the ’60s. A throwback to David Bowie through the vibrancy of the color and the asymmetry of the cut, Doughty takes us back to a time where there were almost no rules. Taking on the expressionism, this look is wearable; much like the Roberto Cavalli and Lanvin SS16 runway shows where seventies-inspired grunge meets modern chic style. All over the runways of NYFW SS16, the bang, especially of the shag variation, were rampant. 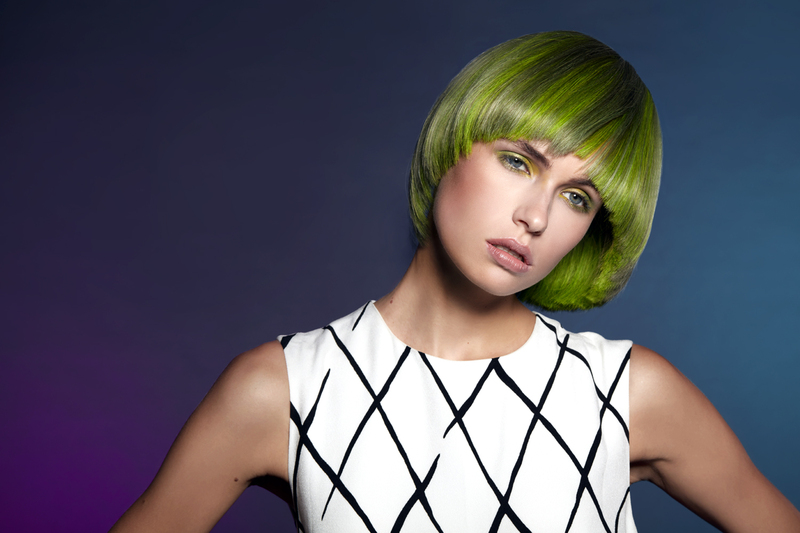 The face-framing shape has a mod feel with electrifying shades of green. Blunt shapes are given true depth and dimension by adding and blurring the lines of color to create something visually stimulating as Doughty does here. She uses color techniques such as tie-dye to blend patterns and sections of color from a silvery-blonde hue to indigo blue shade creating a highly multi-dimensional graphical feel. For more inspiring tips, click here. Instead of ditching your sun kissed blonde tresses for the season, transform them into face-framing highlights of rich honey or caramel bronze as seen on Rosie Huntington Whitley, Miranda Kerr and Jessica Biel. It’s true: Blondes always want to have fun and fall is the time to play up icy or wheat blondes. Balayage is a great technique for achieving shades like these seen on Gigi Hadid or the Paul Mitchell® color XG® model Olga. Rose gold was a summer hair color favorite and is still relevant as we head into fall. Talk to your Paul Mitchell colorist about adding in copper tones to create a warmer shade for winter. If you’re up for a spicy mix, it’s all about copper. Try strawberry blonde or a rich, deep copper. Help your clients welcome the change of seasons with these on-trends hair colors and show us their final color transformations by posting a photo to social media with #IHeartPM. Tradition meets technology really says it all when it comes to Awapuhi Wild Ginger®. In 2010 when we launched the Awapuhi Wild Ginger, the new line of products provided a breakthrough in hair care technology; these products repaired hair, improved shine and prevented color from fading. Awapuhi Wild Ginger product are not only a salon favorite, but also my go-to products when I am styling on set. The fact that I can add hydration to hair while creating volume is invaluable to me as a stylist! With five styling products, there are endless possibilities for creating beautiful, show-stopping styles. One of my favorite looks to create using Awapuhi Wild Ginger products is the beachy set. I like to blow dry Awapuhi Wild Ginger Texturizing Sea Spray® into wet hair, then add light mists and dry into the hair for loose, tousled texture. It’s a great way to add texture and volume to any hair type, especially fine hair. 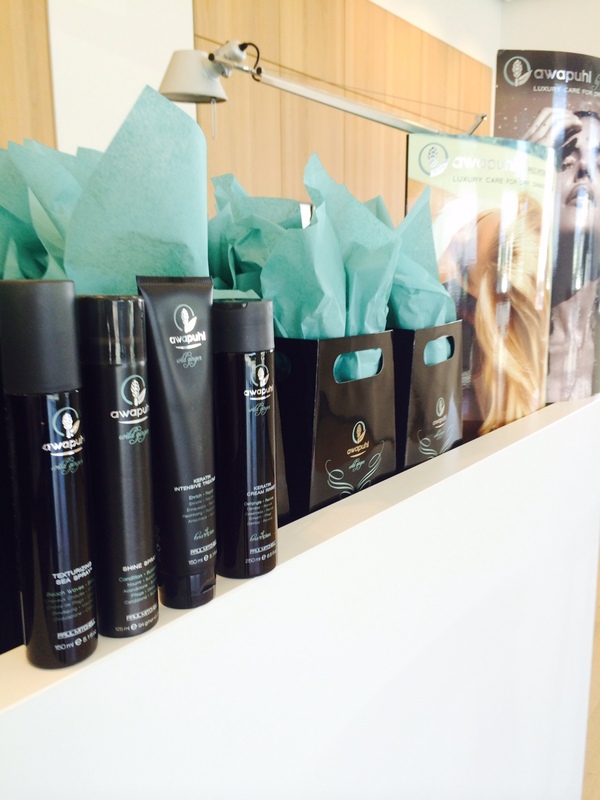 What’s your favorite Awapuhi Wild Ginger product? Much to my delight, braids are still as popular as ever. The rise in braiding tutorial YouTube videos and social media images has made various braiding techniques more accessible and thereby even more prevalent. To celebrate the beauty of braids, I am sharing the products I love to use when creating braided styles. Oftentimes, silky hair is very slippery and does not hold well in a braid. To add a bit more grip, I like to prep the hair with Dry Wash®. The additional grip will not only help the hair stay in place, it will also give the finished braid more texture. When working with slippery hair, apply the Dry Wash in layers until you reach desired texture. Awapuhi Wild Ginger® Texturizing Sea Spray® is another great, lightweight product for building texture. When lightly misted into dry hair and blow dried in, this spray gives hair amazing grip and can make the braid feel for organic. I like to use it on fine hair to create fullness and body. Lastly, I also love to use Lemon Sage Thickening Spray® to add fullness and texture. A layer or two of this product will plump up your strands and make them easier to braid. If you’re trying to calm down texture, use a small amount of Awapuhi Wild Ginger® Styling Treatment Oil®. This lightweight product smoothes hair and adds shine. Using this with Worked Up® hairspray can give you a helpful hand. For really unruly hair, I rely on Foaming Pommade™. This product this smoothes and softens the hair and gives great shine. And, finally, let’s not forget about Wax Works®. 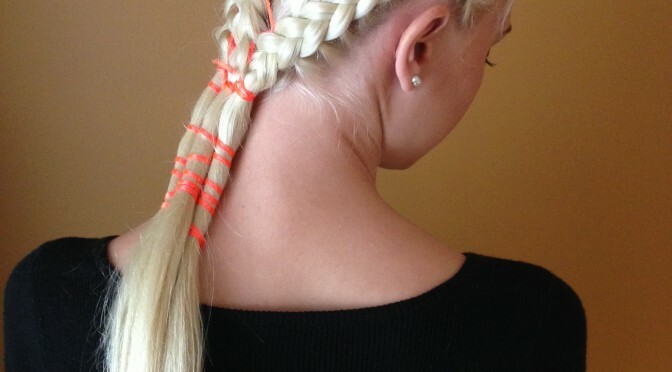 This product will hold the braid together and gives amazing shine. Based on hair texture and desired end result, pick products that help and aid in your braiding. We all draw inspiration from one thing or another, whether its fashion, an artist or a celebrity. On a recent trip to one of our Paul Mitchell Schools I was inspired by one of the future professional’s gorgeous, long hair. 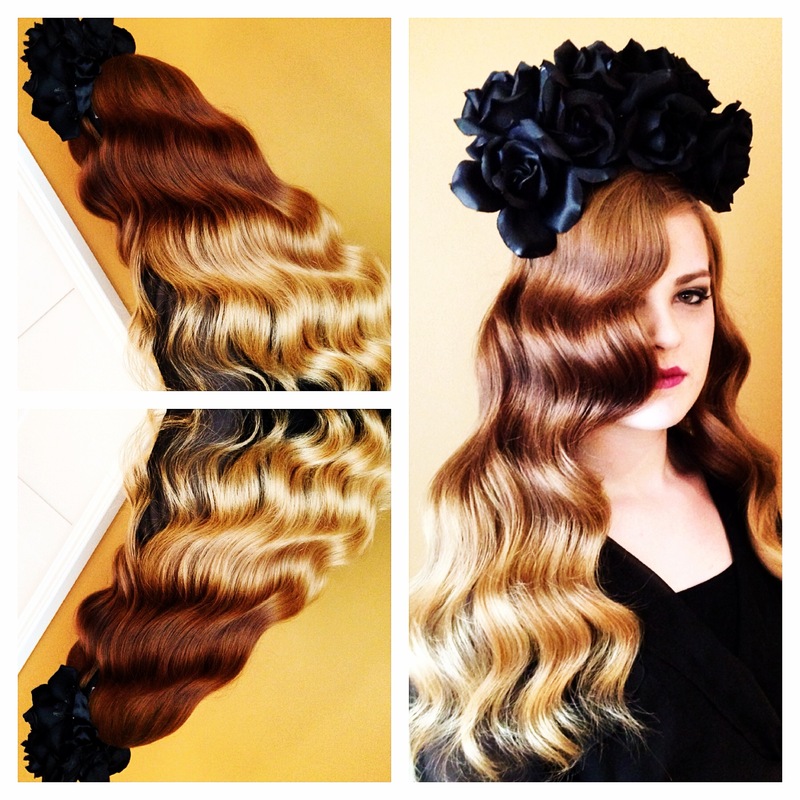 We decided to create a Lana Del Rey inspired look on her hair, including her signature flower headband. I started off by cleansing her hair with Instant Moisture Daily Shampoo® and Daily Rinse as her hair was in need of hydration. Then I applied Fast Form® to provide hold, memory and shine for this style. Using a paddle brush and Neuro® Dry, we pre-dried the hair and then finished the last 20% with an extra-large Express Ion Round® brush for additional volume and polish. I applied Awapuhi Wild Ginger® Styling Treatment Oil® to her ends for extra reflection and shine. Once the hair was dry, I applied Hold Me Tight™ to each section before I wrapped it around the Neuro Unclipped 1” rod. I started at nape of the neck, working the curl vertically in the same direction from left to right. I curled all of her hair in 2” panels until the entire head was wound. Then, I allowed the curls to cool before brushing the set through with a 413 brush. 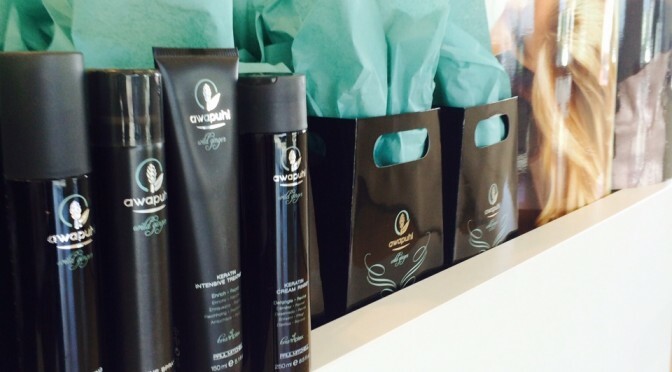 The finishing touches were done with a comb, a final spray of Hold Me Tight and Awapuhi Wild Ginger Shine Spray™. To make this complete, I added a headband and voila! We had our Lana Del Rey inspired look. I am always looking for easier, smaller, more compact and travel-friendly tools, so imagine my delight when I realized we created a Pro Tools™ iron that was all that and a bag of chips! 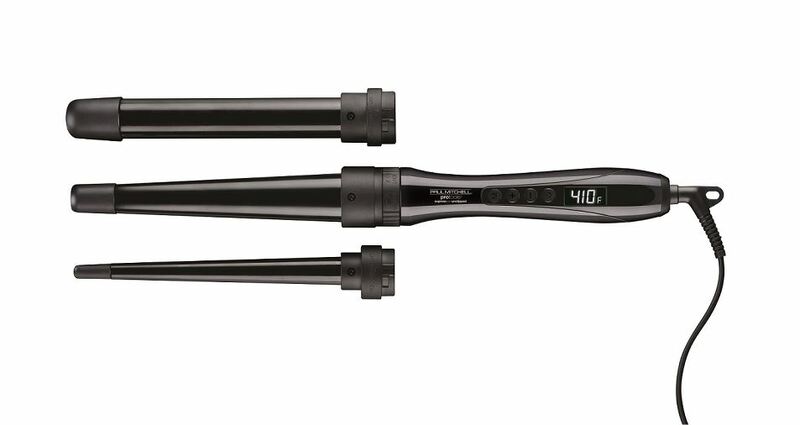 The new Express Ion Unclipped 3-in-1 has recently become one of my go–to tools. This iron features three interchangeable barrels for creating loose waves, natural-looking curls and ringlets, all with one iron. As a traveling freelance artist, I love to be able to lighten my load a little (especially when I am on my 4th flight of stairs!) without removing must-have tools and products from my kit. Being able to clip one of the three rods onto the iron makes my bag lighter and still allows me to create any set or style. Since textured styles with loose curls are so popular right now, I like to use 2 or all 3 of the rods on my clients to create an organic, wavy look. And my salon guests love the tool too! Many of them have purchased it to bring along when they are traveling or simply keep it in their gym bags for styles on the go. If you haven’t checked out this multi-tasking tool yet, get on it! The holiday season is upon us and as you know, this time of year is generally the busiest and most hectic! By the time January rolls around, most of us are ready for a change of pace and in need of some new inspiration to kick off the new year in the salon. Education has always been something that I use to get my creative juices flowing and my mind buzzing when I am in need of inspiration. 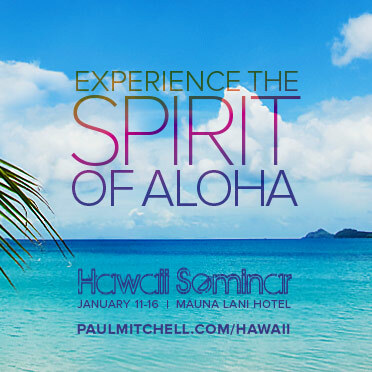 This year I’ll be doing just that by attending Hawaii Seminar! The interaction with like-minded artists and a break away from the norm is the best way I have found to start off a new year. Last year was the first time I participated in Hawaii Seminar and it was such a treat! Not only because Hawaii is one of my favorite places to be—a place to relax, enjoy the warm sun and a cocktail—but the intimate setting of Hawaii Seminar was like nothing I had ever experienced. With such a small group, I was able to get to know the individuals who attended and spend a decent amount of time chatting, instead of rushing off to the next venue. This year we have a fabulous agenda of cutting, styling and color. I will be participating in the color and style segments, and I have been busy pulling tears, researching and practicing some looks for the event that I can’t wait to share with you. I hope that you can join us and take part in a special week of education and connection. And let’s not forget the tan! How long have you been a Regional Color Coordinator? I have been a Regional Coordinator for almost two years and every single day is different from the last. Why did you choose to partner with Paul Mitchell? I started this venture in the beauty industry at Paul Mitchell The School – Sherman Oaks and I drank the Kool-Aid, as they say, on my first day of Core! Once I learned about all of the philanthropic, animal-friendly, environmentally conscience things that John Paul Mitchell Systems stands for, I knew this would be a lifelong partnership. It’s very important to associate yourself with people and ideas that parallel your own personal values and goals, and Paul Mitchell does just that for me. What is the most important piece of your role as a Regional Color Coordinator? I’d have to say the most important piece of my role as an RCC is being the face and energy of Paul Mitchell Professional Hair Color around the clock… we never stop representing what we stand for! What is the funniest thing that has happened to you while working in the field? The funniest AND most incredible thing that has happened to me in the field has to be realizing that I was in bumper-to-bumper traffic next to John Paul DeJoria on my way home from an in-salon class. I wanted to really catch his attention to say hello so my first impulse was to grab my shines XG swatch book from my backseat (as an RCC, your car is just bursting at the seams with color tubes, swatch books, mixing bowls, etc., and this was the first thing within reach) and wave it at him while yelling out the window,. “JP, I LOVE YOU!”. His reaction was so sincere and hilarious—he rolled down his window and with a chuckle demanded that I pull over and take a selfie with him. We spent 20 minutes sitting on the shoulder of the Pacific Coast Highway, chatting about our day and taking selfies. I will never forget that! Describe a special moment as a Regional Color Coordinator? A special moment as a Regional Color Coordinator is walking into a salon that has never used Paul Mitchell color and feeling the hesitation, nervousness, and a little bit of resistance from stylists, and then seeing their emotions and ideas start to make a 180-degree turn. Then hearing them say “I want to be Paul Mitchell.” That magic moment for some happens after you make that final turn of the stylist chair after finishing a blow-out on your color model, or for some that moment comes when they hear JP and Paul’s story. For others it happens when you tell them, “We are, and always will be, here for you.” It’s when they realize that they want to be a part of this revolution, that’s when I experience that special moment as an RCC, and nothing else could ever make me feel that way. Paul Mitchell has created so many opportunities in color: Paul Mitchell the color, PM SHINES®, Dual-Purpose Lightener, SynchroLift®, Lighten Up®, Flash Back, Flash Finish®, Color Shots® and the newest addition, shines XG™. Which of these tools is your personal favorite and why? You wouldn’t believe how hard this question is to answer! I suppose if I HAD to pick one, it would be SynchroLift. I think that this lightener gives such an incredible foundation for any and all blonding flavors. 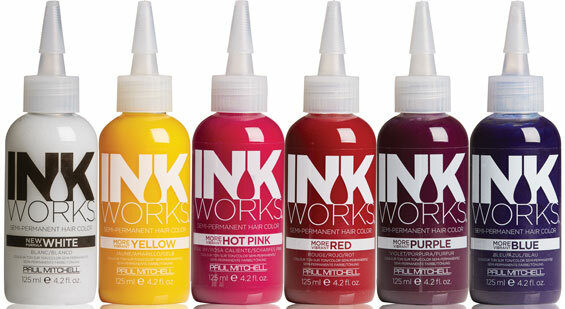 I’m a huge INKWORKS® fanatic (anyone that knows me definitely knows this), and SynchroLift always helps me get those gorgeous levels of lift while keeping the hair integrity and texture fabulous so that my end INK result looks consistent, even and predictable. In Southern California the majority of your guests are either going blonder or blondest, and when I have the luxury and convenience of using this gentle on-and-off-scalp technology, it helps my business grow and heads turn. Please share one of your all-time-favorite formulas. I can’t really narrow this down to one, so I’m going to give two! The first one I like to call “Double-Dipped Chocolate Cherry” and it consists of equal parts Paul Mitchell the color 6RR and 5NN. It’s simply delectable. My second is equal parts shines XG 7RO and 7RV. This ends up being the most incredible, vibrant, lip-smacking fruit punch color. What is your favorite color pre-treatment or post-treatment? My favorite pre-treatment ritual is Shampoo Three® and Awapuhi Wild Ginger® KeraTriplex® 2-Step Repair. Let’s face it, hardly anyone’s hair is virgin nowadays. 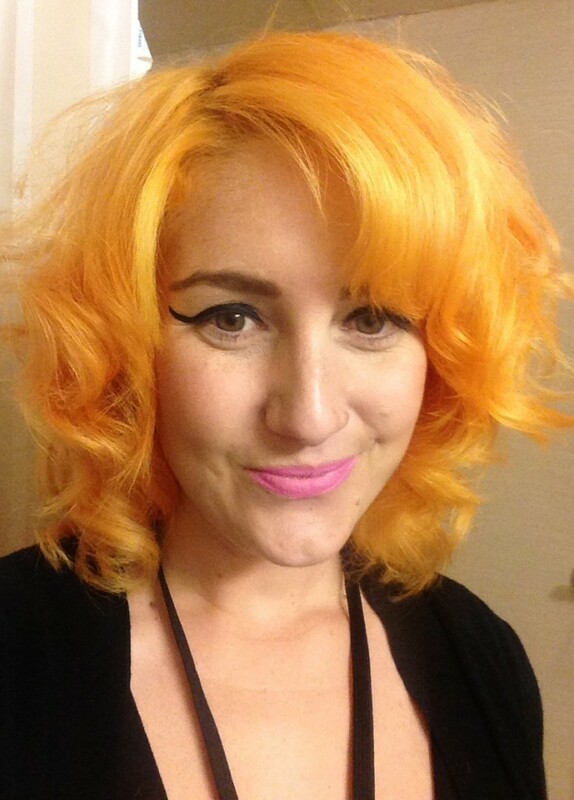 If you’re not coloring your hair, you’re certainly in the sun and/or heat styling every day. This pre-treatment gives me the greatest predictability and it’s a service upgrade! As for my favorite post-treatment, I can’t get enough of the Ultimate Color Repair® 3-part system. I always use Color Protect® Post Color Shampoo to get in there and hunt down any un-oxidized stragglers, but once that’s finished, my guest will get to experience the beauty and awesomeness that is the Quinoa Color-Locking System in Ultimate Color Repair. What is the biggest gift Paul Mitchell and your position as a RCC has given you? Every single day I pinch myself to see if this is a reality. Once I fell in love with Paul Mitchell, it had always been my dream to represent it with my whole heart and soul and give back to the company and the hairdressers that believe in it. Every single day is a gift working for John Paul DeJoria and Angus Mitchell. What kind of legacy would you like to leave everyone with? Always have fun, believe in yourself and give back. Whether you’re a hairdresser or not, I would love to influence people to do what they love, be happy, always smile, and don’t let anything ever stop you. Is there anything else you would like to share? Not only has Paul Mitchell shaped my life, dreams, and goals into something obtainable and positive, it has also brought me to meet the love of my life! While working as the color specialist at Paul Mitchell the School Sherman Oaks, I met my now husband, Michael, when he was a Future Professional. I believe that when you surround yourself with the right people and the right culture that brings out the best in you, good things come and your path just opens up right before your eyes! And sure enough, our stars aligned and I have Paul Mitchell himself to thank! We saw some amazing things happen with hair at The Gathering this year! Whether you were physically present at the event or watched via the live stream, there is no doubt that we all left inspired. One of my favorite things I saw during this year’s event was the amazing hair color on the models. There were numerous examples of one of the hottest current hair trends: pastel toned hair. It inspired me provide some tips for achieving the perfect pastel tones. The first, and possibly most important thing to do, is to be honest with yourself when considering the end result. If you want to achieve a super light lavender color, you will need to get your canvas to a point where there is no yellow left in the hair. Otherwise, the perfect shade you create in the bowl will only tone the hair and you won’t see enough of the desired pastel color. The same goes for any of your cool colors. If the canvas isn’t clean enough, the lighter colors won’t show. 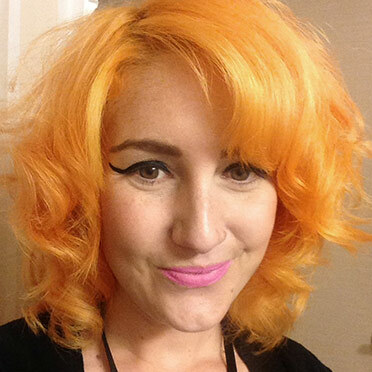 If you can’t quite get the hair beyond the yellow stages, opt for a different shade. Peach is a great option because it still has some warmth. Light pink is also a great option for hair that can only get to pale yellow. Another great option is to aim for a deeper tone in your final color. Instead of a light pastel, consider a slightly darker color to create a gem-toned look. The more color pigment you use, the more it will tackle any underlying pigment left behind after the pre-lightening. While deep into one of my inspiration image searches, I came across this style that I absolutely loved. Instantly, I wanted to create a how-to for the look, especially because the silver sparkly roots caught my eye. Just like you, I love getting artsy, so here is what I came up with to create this beautiful look. 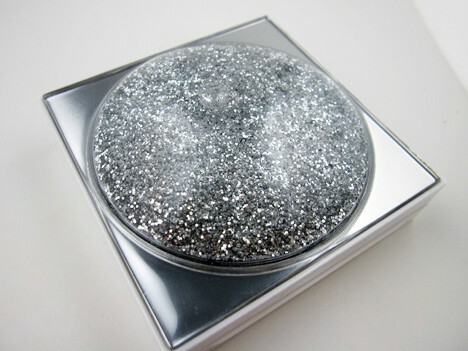 To make the sparkly root powder, smash your silver eyeshadow into a fine powder, and then begin to slowly mix it little by little with your baby powder. 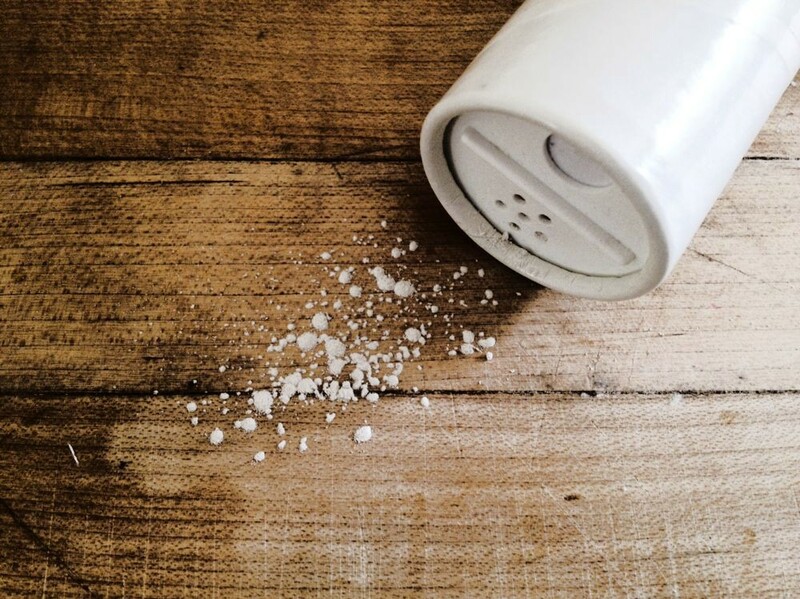 Once you achieve your desired silver color, place the mixture into an old salt shaker or a little jar or dish that will allow you to sprinkle the mixture easily. 1.) Begin working with freshly washed hair that you have styled smooth. 2.) Part hair into center or desired part. 3.) Lightly spray the hair from the roots to the top of the ear area with water and comb only this area until the hair is saturated. Be careful not to let the water drip onto the dry hair. 4.) Spray the damp hair with Paul Mitchell Freeze and Shine Super Spray and comb the hair that is damp. The Freeze and Shine Super Spray applied to damp hair will dry, leaving the hair looking a bit wet. 6.) Using the Express Ion Curl, slightly curl desired area of the dry hair. 7.) Use your fingers to gently ruche the hair you have just curled then lock in place using Hold Me Tight Finishing Spray. 8.) Using your Freeze and Shine Super Spray, spray the root area where the part is and gently sprinkle the silver sparkly powder onto the hair. Allow to dry. And that is your completed style! I hope you have enjoyed this DIY project. I always enjoy combining my Paul Mitchell favorites with out-of-the-box tricks to create beauty. This look is great for editorial and runway. Post pictures of your finished versions of this look and tag @paulmitchellus and #paulmitchell so we can see your creations.